Blackberries sold for about 25 cents a quart in the summer of 1921, when Frank Heckathorn and his cousins made a few dollars a day collecting them from the roadsides north of New Castle and selling them in the city. On the afternoon of July 15th, they had driven some miles out on the Pulaski road and Frank was searching for huckleberries in the bushes and trees by a lane on the old Greer farm when he came across an almost naked, battered body. He could not tell if it was a man or a woman. Frank heard “a slight noise” and ran back to his cousin and his cousin’s wife. He told them what he had seen and one of them suggested that it might be a case of murder. If it was, the murderer might still be nearby. They returned to their car and drove two miles around the farm to the lane, so that they could investigate in safety. Parking at a spot near where Frank had seen the body, they shouted into the wood—“Hello? What’s the matter, buddy?” and “Are you sick?”—but received no reply. The men told each other that it was probably a passed-out drunk and they drove off. Frank’s cousin’s wife began to cry, and didn’t stop until they pulled over at a friend’s house on the Wilmington road and called the sheriff, who drove out to meet them. Frank and his cousins had not heard the news but a fourteen-year-old girl from Moody avenue, Clara Bell Lennox, had gone missing the previous morning. Her parents had contacted the police some hours after she should have returned home. A description of her had been issued—she was “of quiet disposition”, she looked like a girl of sixteen, her shell rim glasses gave her a mature appearance, she had a squint in one of her eyes—and at that moment, groups of police and volunteers were searching the city and its environs for any trace of her. The sheriff examined the body. Clara Bell’s back was covered in deep scratches. Her skull was cracked. Her left eye had been knocked out of her head. But she was still alive. Frank was sent to the nearest house to borrow some sheets to wrap her in but, by the time he returned, the sheriff and his cousins had left, taking Clara Bell with them to the hospital. After Clara Bell recovered, she identified a local forty-one-year-old man named Thomas Verne Ryhal as her attacker. He had met her on Highland avenue, near her home, and offered to drive her into town. She had accepted but, instead, he had driven her out to the lane on the old Greer farm, where he told her that his wheels had become stuck in a rut. When she knelt down to see what the problem was, he hit her with a monkey wrench. Four months after the attack, while Thomas Rhyal was on trial for assault, Clara Bell collapsed with convulsions. She died soon after. The autopsy discovered an abscess at the base of her brain, caused by an infection that had entered when her skull was fractured. The charge against Thomas Ryhal was changed to murder. 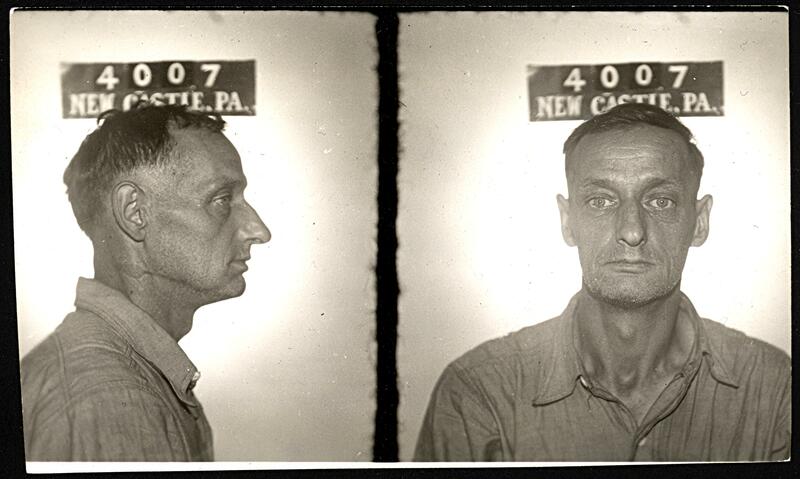 Frank’s role in the trial was small—he was twice called to tell the story of his discovery of the girl—but his description of the scene helped the prosecution to convey the callousness of Clara Bell’s killer. Thomas Ryhal was found guilty and sent to the electric chair in Rockview penitentiary one year later. Frank and his family moved to a farm near Volant, in the north of Lawrence County, in the thirties. In 1943, just after midnight on July 10th, six boys who were parked near Graceland cemetery, on the eastern edge of New Castle, were frightened by what they described to police as a half man, half beast that scratched on the car’s window and waddled away when they shone a flashlight on it. The canine control officer examined the area but could find no animal tracks. The police suspected it might be a pervert. The next night, posses of youths roamed the Graceland and Oak Park cemetery districts looking for the creature. State, county and city police were out in force, too. They arrested half a dozen boys and girls for trespassing in the cemeteries and one man—Frank Heckathorn—for indecent exposure. Frank was given a $1 fine and four months in the county jail. The half man, half beast was never seen again. Sources: New Castle News (15 July 1921, “Clare Lennox, 14, Disappears While On Trip To Store”; 16 July 1921, “Persons Who Found Lennox Girl Tell Story Of Discovery”, “Girl Battles For Life”; 16 Dec 1921, “Clara Lennox’s Testimony Is Read To Jurors”; 25 July 1921, “Ryhal Now In Custody”; 26 July 1921, “Davies Girl Identifies Ryhal”; 25 Oct 1921, “Verne Ryhal Given Hearing”; 14 Nov 1921, “Clara Lennox Near To Death”; 28 Nov 1921, “Charge Ryhal With Murder”; 30 Oct 1922, “Ryhal Pays Death Penalty”; 1 April 1937, “Personal Mention”; 10 July 1943, “Mystery Creature Is Being Sought”; 12 July 1943. “Police Warn All Amateur Posses”; 14 July 1943, “Around City Hall”; 17 July 1943, “Sentence Court”). Still following…fantastic work as usual. Glad to hear it, Lance, and glad you liked it, too! And thanks for dropping by, Ruby!